Yesterday Lucy and I hit our favorite farm stand and bought a big pile of summer produce. Have you ever heard of a black apricot? Neither had Lucy. We enjoyed one together after lunch today. 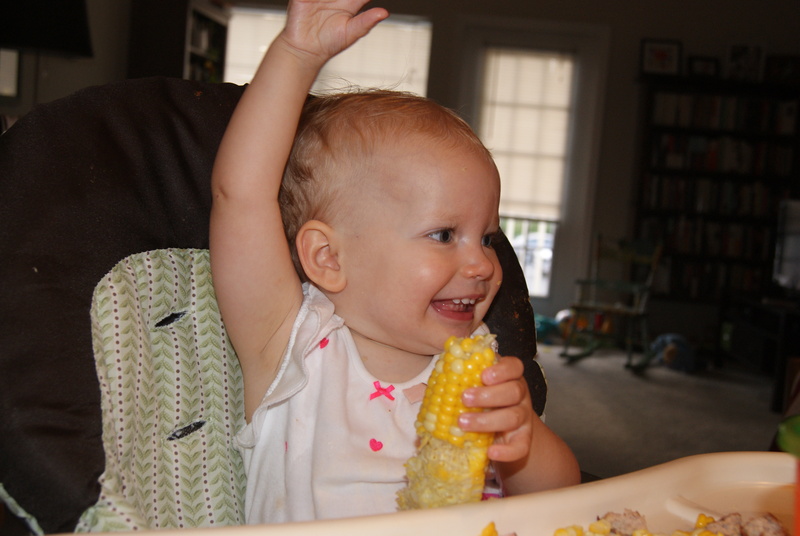 But last night we made a lovely dinner of corn on the cob, real tomatoes (!!! Lucy’s first real tomato, sentimental tear), pattypan squash, local spinach, farmstead cheddar, and…some Trader Joe’s turkey burgers ahem. Lucy has this little problem. It’s called corn. 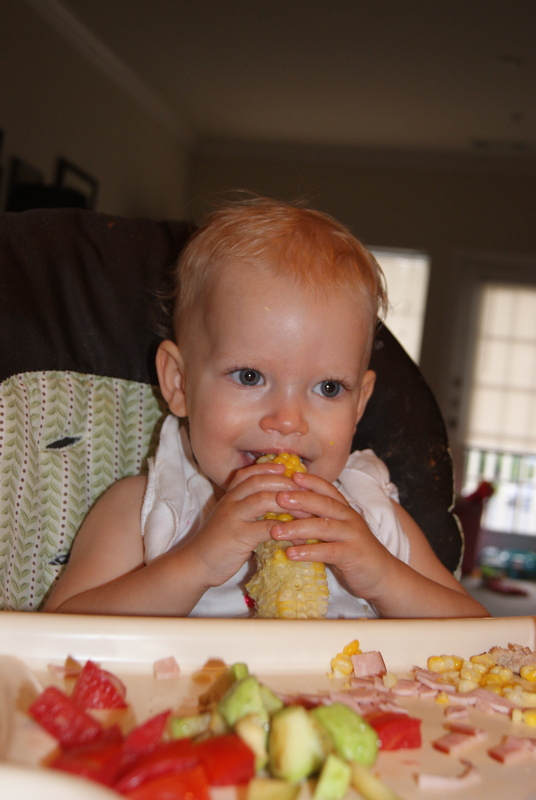 She ate most of my ear of corn after I cut it off the cob, and then started up the point-and-hoot thing that toddlers do so well until I handed her the rest of my ear. I think I got three bites. She was *so* happy. After dinner I sent Lucy off to the tub (bathtime is and always has been Dad’s chore) while I cleaned up and unpacked a very special box my mom brought up from Tennessee for me last week. This box, an old egg box filled with newspaper and vintage Pyrex and glass, has come all the way from Oklahoma to Massachusetts without once having been mailed or brought on an airplane. 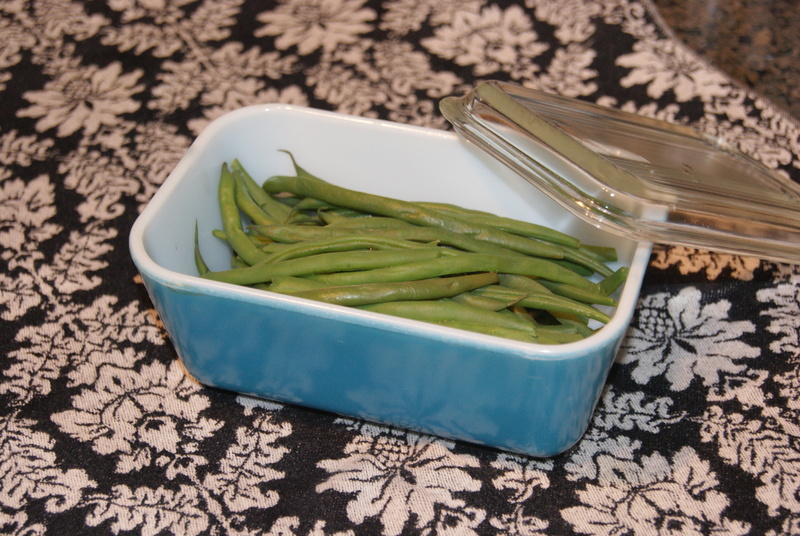 You can’t replace your late great-grandmother’s Pyrex dishes if some doofus breaks them. 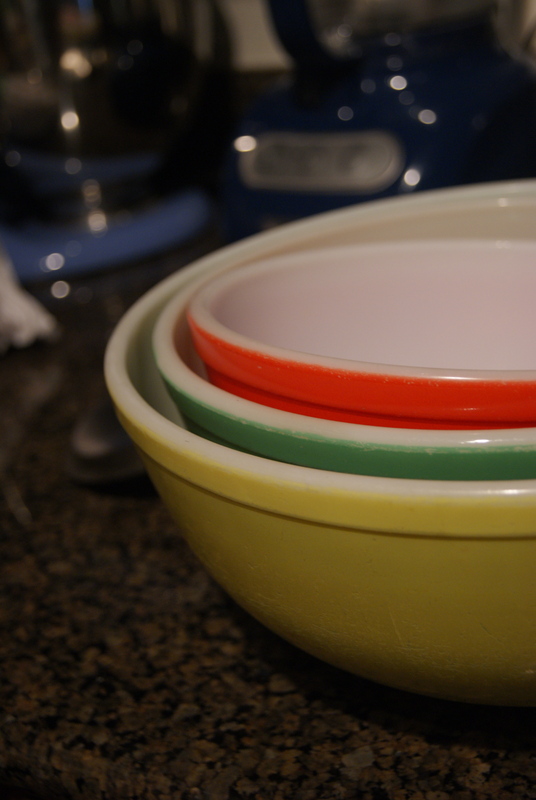 These nesting mixing bowls are clearly the prize. Funny how the colors exactly match Lucy’s summer tomato-squash-corn dinner from last night! This morning I carefully washed every piece and reorganized my cabinets (read: finally packed away the stupid clutter of bottles and sippy cups that my picky kid always refused in the first place) to find a home for each piece. Because I’m going to USE these suckers, baby. 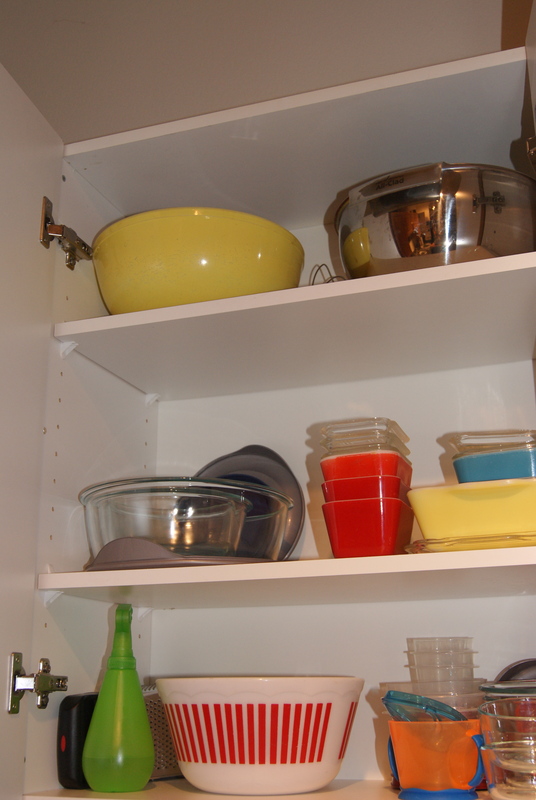 After I googled around to make sure it’s still safe to use 30-year-old Pyrex, natch. P.S. My mom texted me yesterday afternoon to tell me that she saw a similar set of mixing bowls in an antique store for EIGHTY-SEVEN DOLLARS. Seriously. 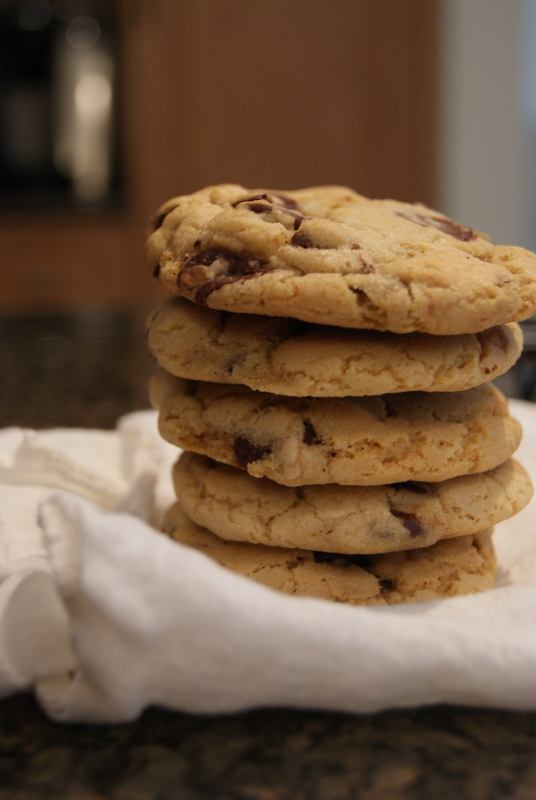 sometimes, all you can do, short of grumbling back at the toddler (though, trust me, that doesn’t work, and never will), is bake and eat chocolate chip cookies. 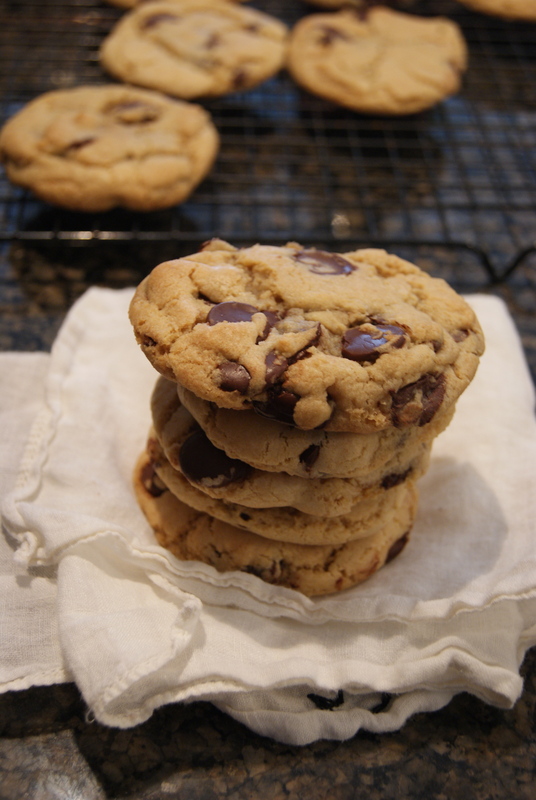 I use America’s Test Kitchen’s Thick and Chewy Chocolate Chip Cookies recipe. I’ll NEVER need another one, never not ever. (It alone is probably worth subscribing to their site, or buying the America’s Test Kitchen Family Baking book.) I eat one, freeze the rest, and then eat the rest of them all straight out of the freezer. The only acceptable chip is Ghirardelli 60%. 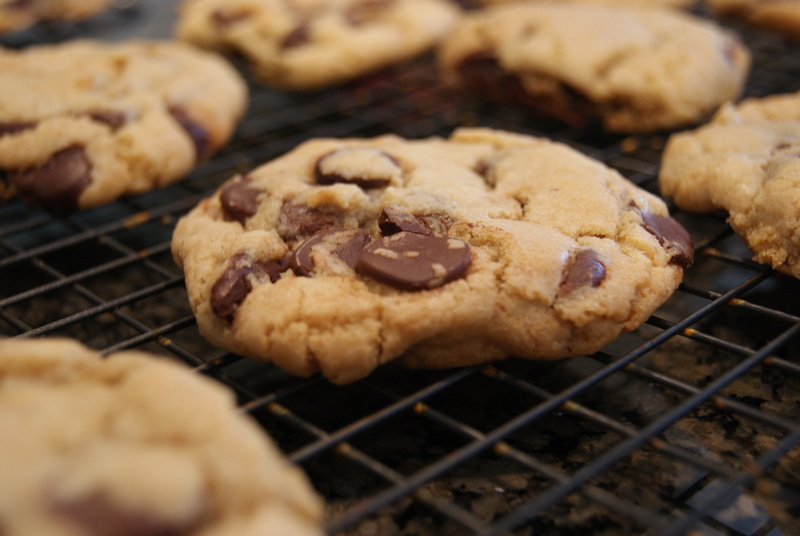 Please, do yourself, your spouse, and your toddler a big favor and eat yourself a batch today.